Anne, Jill & Mary are about. 1 1/4" in height..
works very nicely as a miniature tree topper. The underskirt is draped first of white fimo. Then another smaller piece of pink fimo is cut out and draped over the underskirt. The front part of the skirt is turned back slightly to reveal the lining which will be accented with gold powder. 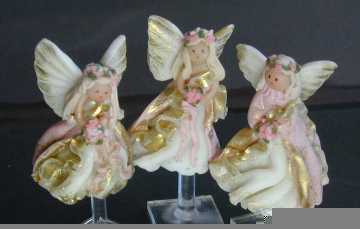 Anne also has a two bows on the front of the skirt that are very draped with folds and she holds a bouquet as do the others that is small snippets of fimo in pinks and greens arranged to look like flowers. Garlands on their heads are also created in this manner. Gold powder is applied before they are baked to the lining of the overskirt, the bows and the tips of the wings. 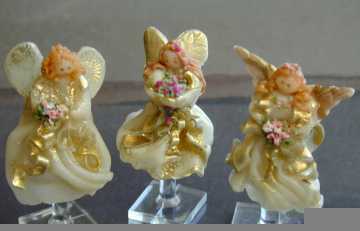 You can make angels that are very country style with the method and non transparent fimo. They can be holding bird houses, tiny birds, veggies or any other country accessory.